In the countryside, high temperatures caused concern among farmers. “At present, Italy is affected by a high-pressure structure of African origin,” said the expert in meteorology, Marco Giovani. “This was caused mainly by a negative anomaly of the surface waters of the mid-Atlantic, where temperatures decreased below the seasonal average.” He noted that due to this situation, which probably will persist throughout the summer, depressions descended to low latitudes, and as a dynamic reaction, further to the east, the ascent of hot air masses involved the Mediterranean and a good part of Western Europe. “In Maremma, drought has been going on for a year and a half, and already in the spring several olive trees showed poor vegetative development,” affirmed Giovani, who manages an olive grove in Porto Santo Stefano, in Southern Tuscany. While the flowering was delayed but good, the setting was poor. Giovani said that in this area, since last December just 48 millimeters (1.9 inches) of rain fell, where a typical annual precipitation is about 500 millimeters (20 inches). 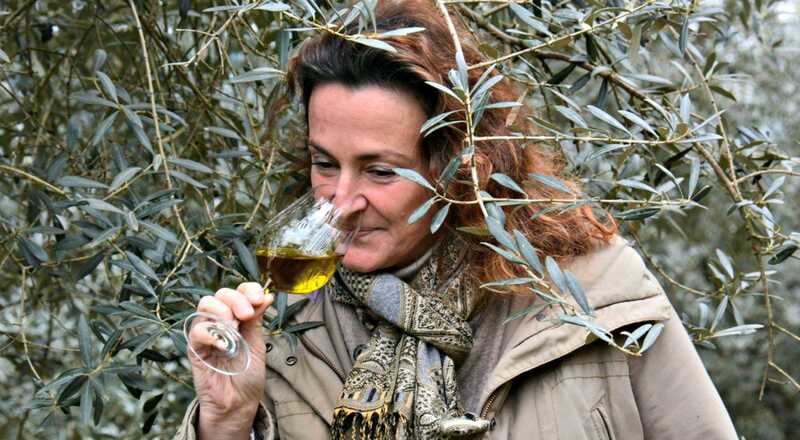 Olive trees can safely withstand 35-36 °C (95°-96.8°F), said an agronomist specialized in olive growing, Fiammetta Nizzi Griffi. “Beyond this limit and up to 48-49 °C (118.4°-120.2°F), the plant develops defense mechanisms, depending on variety,” she explained. Some cultivars become susceptible at 48 °C (118.4°F) and some can reach temperatures of up to 50°C (122°F); then the plant starts showing signs of damage, which are similar to those caused by Iron Chlorosis. “We recently experienced a climatic situation with higher than annual average temperatures, and we already observed some manifestations of suffering in the olive trees,” she said, observing that first, part of flowers did not open because they dried up; then, parts of the flowers opened but did not reach setting because the pollen tube had been affected by hot wind. If the ground hardens too much, rainwater is not able to penetrate and water reserves cannot be created; furthermore, the root apparatus of olive trees tends to develop just below the layer of herbs, competing with their roots. When we make our agronomic choices, we should consider all the relevant factors, not just erosion. “Since the heat is a new issue, we must make sure that soil is able to absorb water and the roots are renewed,” she continued, pointing out that besides the biggest and supportive roots which no longer have absorbing function, we must focus on the vital and capillary root which can absorb water and nutrients, stimulating their renewal. We can count on two systems: pruning and deep tillage. Because, “when a part of the tree is pruned, parts of the roots die and new ones develop along with the development of new vegetation; similarly, deep tillage breaks roots, renewing and making them more receptive to water and nutrients.” In this sense, we can re-evaluate the use of plows and harrows, Nizzi Griffi suggested. In addition, she recommended keeping as many leaves as possible when pruning, because each leaf is a small water reserve to draw on. In this sense, the plant should be leafy, proportionally to exposure to daylight. Moreover, we should reduce the height of the olive tree in order to decrease its effort to feed the vegetative parts and translocate nutrients. Now, the temperature is going back in the range of normal and scattered showers finally refreshed some of the thirstiest olive groves.